Who do you think you are kidding Mr Hannan? Yes I do have it in for Daniel Hannan MEP, this is my third anti Hannan post, but I really think he is the modern day Lord Haw-Haw of the UK Eurosceptic movement and like this traitor utterly despicable. You can read the other blogs here and here. Daniel’s latest rant was published in some dodgy right wing capitalist web site called CAPX. Here Dan Hannan tries to amuse his kipper and eurosceptic Tory friends by constructing an imaginary parallel universe, where Britain had in fact joined the Euro instead of opting out as they did at Maastricht. Incredibly for someone who says he admires and believes in Britain, he then pictures Britain to be languishing somewhere alongside Greece and Portugal at the bottom of about any economic league table you could construct. You can almost see the disingenuous smirk on his face as he amuses his audience by saying…. If we look at the graph on the left, which covers the last four available years month by month, does anyone else [besides Hannan] see a distinct downward trend in our trade with Europe? Now if you look at the graph on the right, we see that exports to the rest of the world (non-EU exports) are indeed outperforming similar EU exports. [Note and all that despite UK being in the EU!]. But if you look careful, you’ll see exports to the EU in 2009 start above the 100 index and while rising to 115 before coming down again to about the 2009 level, they are still well above the 100 start index; so have in fact grown, not ‘dwindled’ as premier #brexit demagog Dan Hannan would have us all believe. Yes the man is either incredibly stupid when it comes to statistics or he is an outright liar. You may make up your mind. But taking this ridiculous analogy of the EURO making such a hash of our parallel universe’s UK economy a bit further, the flip side of this story has to be that [as in reality Britain never joined this most cursed of currencies] any well or at least open minded kipper would expect the UK to find itself at the top of the EU growth league. In other words somewhere alongside it’s Northern European neighbours The Netherlands and economic power house Germany. After all, we have overtaken France and are are overtaking Germany soon, aren’t we #ukip? Furthermore we’re running this growth race without this cursed Euro currency shackled to our booming economy. We had our treasured pound sterling favouring our chances, didn’t we Daniel? 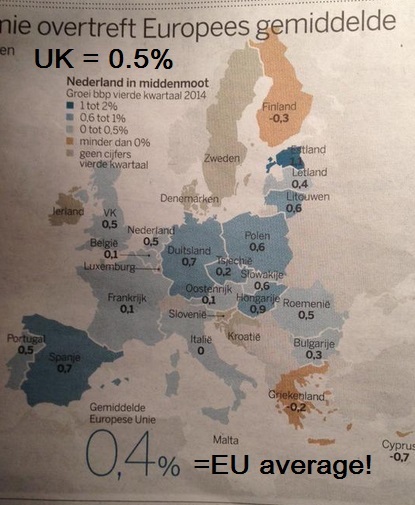 “But Hang on a minute”, I hear you kippers say: Eurozone members Spain, Germany, Poland and those pesky little ones top right on the EU map, they all performed better than the us in the UK? Are we being lied to all the time? Can it be true that the UK growth figure of 0.5% puts us only a measly one tenth of a percent above the dreadful EUSSR average and that is with all these supposed advantages of keeping our sacred pound? Please explore that anomaly dear Charles and other kipper friends. As always looking forward to your jaded comments. This entry was posted in #brexit, EU, EURO, UKIP and tagged #brexit, #euro. Bookmark the permalink. 4 Responses to Who do you think you are kidding Mr Hannan? Britain has a very high rate of home ownership, and therefore private debt in the form of mortgages, than most other European countries. This is why interest rates have been traditionally higher in the UK, because there is a greater demand for debt to finance house mortgages. If we had adopted the euro and moved to drastically lower interest rate environment, it would have fuelled a property boom here, as it did in: Ireland, Spain Portugal etc. The boom and bust would have been truly catastrophic, with the Bank of England powerless to intervene. This is why even the Lib Dems now say they are glad we didn’t join. It is in this regard, and this regard alone, that I would compare the UK economy with the euro’s victims in the medzone. They are a salutary lesson in what can happen when the central bank is robbed of the power to set a suitable interest rate for its economy. Germany enjoys a lower exchange rate in the euro than it would have if it had kept the Deutschmark. This allows German exporters to sell at lower prices than they would otherwise have to do, which maintains demand for their products. The reverse is true in the medzone, where tourism is a large part of the economy, which is made less attractive as they do not have a currency that they can allow to depreciate in line with their economic circumstances, making holidays in these countries more expensive and less attractive than they would otherwise be. My Dear Charles, who are ‘you’ kidding along with Mr. Hannan? You write your comment as if this mythical property boom had passed the UK by and all because Britain was so clever not to join the common currency? I think most people will side with me that the UK enjoyed the same property boom you attribute to Euroland, only in the UK the bubble hasn’t quite burst yet. When I bought my first house in England it was priced less than two times my starting salary as a recent graduate. Before I moved to France it was more than four times my executive salary. No wonder my graduated children find it much harder to get on the property ladder. Many Brits that did not save up for a decent pension have cashed in, selling their overinflated residences and found they could buy properties in France and Spain for a tenth of the price. That is the reality of the situation. You and Mr Hannan might like to blame all woes in the world on the Euro, but the majority of people who read papers other than the Daily Express know that this real estate bubble you two try to pin on the Euro, was in fact caused by greedy US banks, who had a bonanza in sub-prime mortgages and then off-loaded them to dumb EU bankers just before the US sub-prime market crashed. This cause the global depression in 2008, not the humble Euro. And the discrepancy in the growth figures you quote and I quote is explained by the fact that you use total GDP and I use the more commonly used per capita GDP growth. Now you maybe also understand why this mythical growth boom the UK is supposed to enjoy, doesn’t feel that great to people in the street. It all goes to the already super rich in Britain. Contrary to your first assertion the UK did indeed have a property slump from late 2007 until early 2009. There are a number of factors driving the property market, principally in London and the south-east. Low interest rates and quantitative easing that have been necessary as a consequence of the 2008 slump. This means that there is a lot of cash about at lower rates, and this has found its way into asset prices, principally: the stock market and housing. It is only stricter lending criteria is preventing this cheap money from inflating the property price bubble even further. More upward pressure on house prices is caused by the fact that foreign investors use London property as a way of holding assets offshore from economies like Russia, China, and now Greece that is currently experiencing a movement offshore of about €2 billion a month. You are right to point out that this is a dangerous bubble, which may burst when the Bank of England finally put up interest rates, which will strengthen the pound and may cause a round of profit-taking amongst foreign investors. Either way, property is at unsustainable prices in terms of earnings. The following graph shows that the Spanish property price boom followed the lowering of interest rates (shown in graphs previously supplied) as a consequence of convergence for joining the euro. You cannot deny that lower interest rates allow more people to enter the property market, which bids up prices. The large interest rate falls, shown in the tables previously supplied and the subsequent high property prices rises coincide with what economic theory would indicate. The bust that was triggered by the 2008 slump continues, and in fact, the bank of Spain, has warned of further property price falls in the future. The lowering of interest rates and the property price rises, follow each other like night follows day. The government further compound of the risk by only requiring these organisations to hold half the assets that the normal lender would need to hold to make its loans. This resulted in a massive wave of housebuilding, which was further incentivised by giving developers tax breaks to build low-cost housing. All this meant that by 2008 these organisations had issued securities worth US$5 trillion, which sat on the balance sheets of banks worldwide. Despite all this, the credit ratings agencies on which the market relies for the creditworthiness of assets that banks put hold, still rated securities issued by Fannie Mae and Freddie Mac as triple-A right up until the eve of the crash, despite warnings that the Federal reserve could not, and would not, stand behind them. This is broadly because of the strange nature of these organisations as government-sponsored enterprises, which had been subsequently floated off to shareholders. However this does not excuse the fact that the credit ratings agencies did not put these organisations under the microscope, long before then, the criminal failure to regulate on the part of the government. Nobody can prosecute, the government for its criminal failure to regulate, but the government, quite rightly, is taking action against the credit ratings agencies. Standard and Poor’s has recently made a settlement with the US Treasury. The graph of the US house price boom and slump has a sadly familiar shape. It is a consequence of a deliberate government policy to meddle in the property market to such an extent that 55% of the mortgages issued in 2007 were sub-prime. Oh yes, the politicians point the finger at the greedy bankers, who were admittedly, fully culpable participants in the property price boom, but they were not responsible for its existence as it was originally created as a consequence of government action, both in the US and the euro zone. You are right about per capita GDP growth in the UK. In the interest of fairness, here is an article on that very subject. It is a fact that governments of every colour have been importing economic growth, on the cheap, through mass immigration. Productivity growth in the UK is a serious problem, but not one that can be directly addressed by government. It is enterprises, through competition and technical innovation that should be raising productivity. None of this changes the fact that high unemployment, and low growth in the medzone countries is a direct consequence of their membership of the euro, which suits countries in the northern zone, principally Germany, which has its exports artificially subsidised by the low exchange rate of the euro that is consequent upon it sharing a currency with the medzone. The consequences of lower interest rates are starkly obvious in the case of Spain, and it can be safely assumed that a similar bubble would have developed in Britain and would have resulted in a crash that would have been utterly catastrophic compared with the one we actually had. We are better off outside the euro. Germany is better off in the euro. The medzone would be better off, if it had never joined the euro. As usual a well researched response but a bit off topic don’t you think?